At least 13 people have been killed by suicide bombers after they detonated a car packed with explosives in an attack near a major international airport in Somalia. Two bomb blasts hit near the main entrance to Mogadishu’s Aden Adde airport, close to a base for African Union (AU) peacekeeping troops. Islamist terror group Al Shabaab claimed responsibility for the attack, saying it had killed more than 12 people. The two attackers targeted the African Union’s main peacekeeping base in Somalia’s capital, which has witnessed a rise in Islamist attacks in recent years. The first detonated a car bomb near the gates of the compound, which lies close to the airport, and the second tried to storm the base on foot. He was shot before he detonated explosives at the gate. The area surrounding Mogadishu’s airport is designated a secure “green zone” for foreign embassies as well as UN and AU peacekeeping forces. Eight of the dead were UN staff and three were civlians, with a further five people injured in the blast. Ambulances have been seen taking those caught up in the attack to local hospitals. The African Union’s AMISOM force said it condemned the “senseless attacks that aim to disrupt and cripple the lives of ordinary Somalis”. Al Shabaab militants has launched a string of assaults in the capital and beyond in its campaign to topple the Western-backed government. 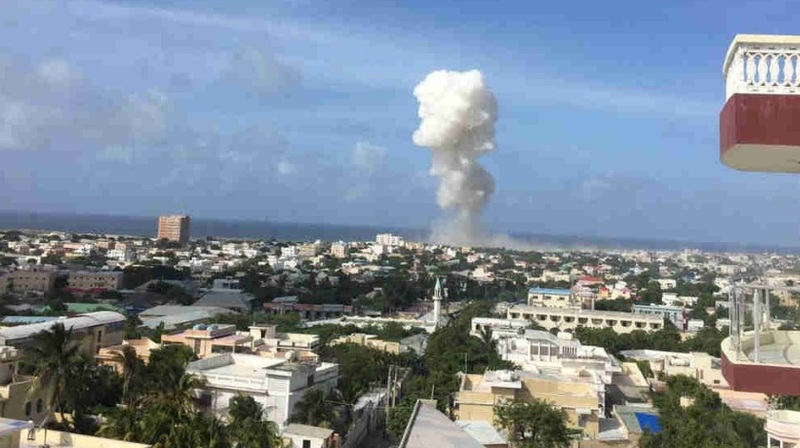 Last month 14 people were killed in another suicide attack on a hotel in Mogadishu, which was claimed by Al Shabaab. The attackers used the same technique, with the first detonating a car bomb outside the gates before the second stormed the building.